Reduced traffic congestion across nearby London Bridge. Provided a new crossing over the River Thames. Southwark Bridge is a steel arch bridge that connects the district of Southwark and the City of London across the River Thames. There have actually been two Southwark Bridges on the site. The current Southwark Bridge has been in place since 1921. It was designed by Sir Ernest George and Sir Basil Mott. It replaced a cast iron bridge designed by John Rennie that was opened in 1819 and demolished around the time of World War 1. Building on the current version of the bridge began in 1912, but it wasn’t opened to traffic until 6 June 1921, because of the war. Rennie’s bridge was known as Queen Street Bridge. It was replaced because at 12.8m wide, it was too narrow to cope with the growing amount of traffic. However, it was noticeable for its cast iron. There was 6,000 tons of cast iron – from Rotherham - in the bridge. 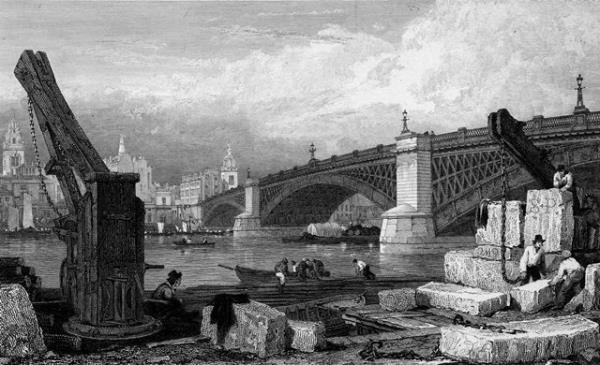 The centre span of the old Southwark Bridge was said to be the widest cast iron span ever built, at 240ft (73m) wide. A span is the distance between two supports for a bridge. The current wider, and stronger, bridge is 243.8m long and 16.8m wide. It measures 216m between abutments. An abutment is a structure that’s built to support the lateral pressure of an arch, for example, the ends of a bridge. It has five steel arches – so five spans - supported by four granite stone river piers. The two spans on either shore are about 45m long, while the three middle spans measure 73m in total. 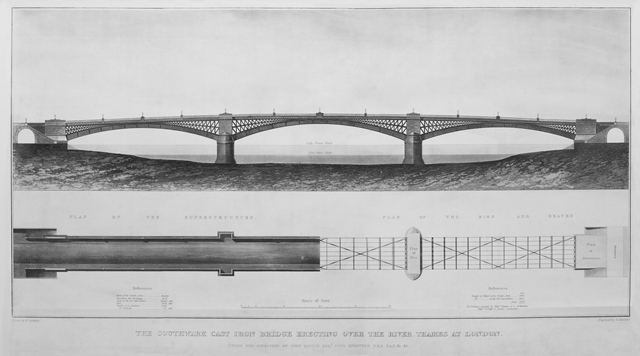 It was designed to have five spans so that the piers lined up with those of Blackfriars Bridge and London Bridge, to make it easier for river traffic to travel through. The bridge was given Grade II listed status in 1995. 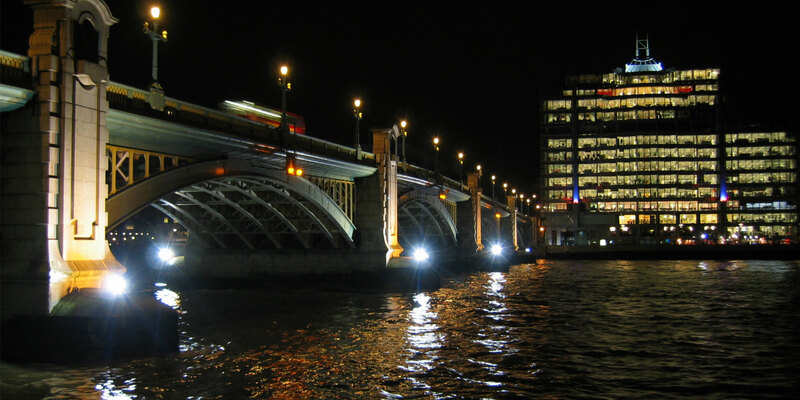 Southwark Bridge was built to provide another crossing over the River Thames, to relieve increasingly heavy traffic congestion on the nearby Blackfriars and London bridges. Sir Basil Mott, past ICE President, was the engineer and architect Sir Ernest George designed the piers and turrets of the Southwark Bridge that stands today. It has five steel arches, supported by four granite piers. It replaced a three-arch, cast iron bridge with two piers on the same site. To build on the same site and keep traffic moving over and under the bridge, two temporary bridges were built across the river on each side of the permanent structure. As well as allowing people to continue crossing over the river on foot, the temporary bridges carried electric cables and gas mains. They also supported cranes that were used to demolish the old Southwark bridge and build the new one. The stonework in the old piers were recycled in the new ones. However, the old foundations were entirely removed down to the top of the beech piling that they were resting on. Pilings are heavy posts put into a riverbed to support the foundations of a bridge. The original piling was left alone. The foundations of the new piers were constructed with the use of steel caissons on the piling. A caisson is a watertight structure that allows work to be done on the foundations of a bridge, by allowing water to be pumped out. This keeps the work area dry. Once the foundations for the four piers was built, they rested on the steel caissons, which were filled with concrete. Southwark Bridge’s five arches each have seven steel arches layered underneath. They’re attached by metal fixtures to make sure the bridge doesn’t bend. 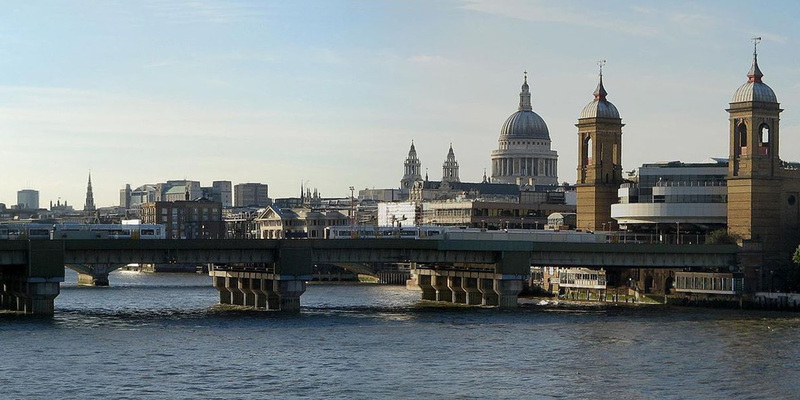 Southwark Bridge has appeared in many films, including the 2007 film Harry Potter and the Order of the Phoenix. The Rennie bridge was also known as the Iron Bridge (compared to London Bridge being the Stone Bridge) and is mentioned by Charles Dickens in Our Mutual Friend and Little Dorrit. The original bridge had a one penny toll. The toll was in place until 1864. 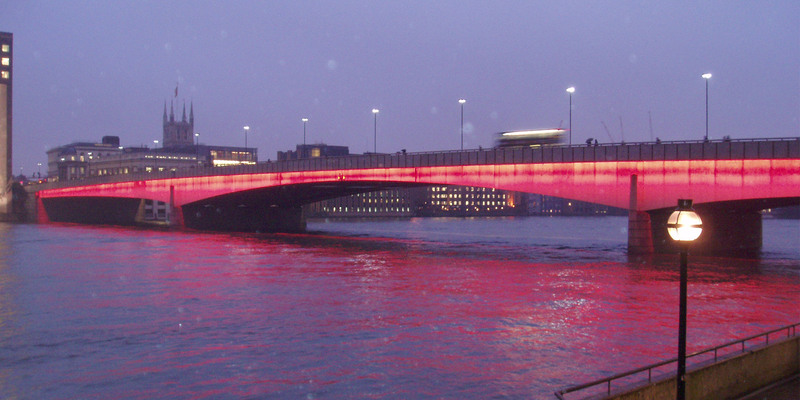 The current bridge was restored as part of a £2.5m, three-year project, and its refreshed look was unveiled in June 2009. More than 1,000 tonnes of expandable abrasive was used to blast the bridge back to its bare metal framework. It was then repainted in its original bright green and yellow, using 13,000 litres of paint. Contractors: William John Joliffe and Sir Edward Bank provided foundations and masonry. Joshua Walker & Co. of Rotherham provided the iron arches. Designer: Sir John Rennie the Elder. Owner: Bridge House Estates Committee of the Corporation of London. Contractor: Sir William Arrol & Co. Designers: Sir Ernest George (architect) and Sir Basil Mott (engineer and ICE Past President 1924).